Browsing in Roger Passeron's "Maîtres de la Gravure: Chagall" (Paris: Bibliothèque des Arts, 1984), I came across a lovely passage I had inserted on a separate sheet of paper, by Robert Marteau, "Chagall as Engraver" (1982) taken, as I recall, from "Chagall Monumental," a special issue of "XXe Siecle" dedicated to Chagall's "large" works (including his series of etchings devoted to the Bible): "The Bible is unquestionably Chagall's masterpiece so far as engraving on copper is concerned, and no doubt it is the single greatest masterpiece of engraving of our age. It becomes plain that everything previous to 'The Bible' found its fulfillment on the Old testament pictures. The anecdotes and observation of 'My Life,' the spontaneity and perspicacity of 'Dead Souls,' the understanding and technical knowledge of 'The Fables of La Fontaine': these all come together in 'The Bible,' and that flowering is complete. 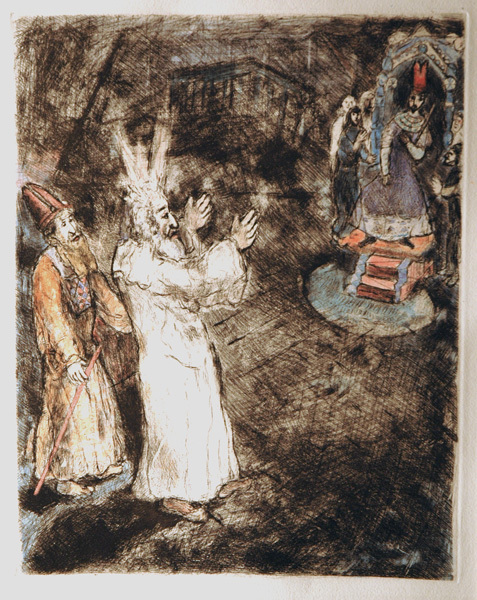 Looking at these 105 . . . [etchings], you would think that Chagall learned how to engrave in Berlin with the intention of going back to the source of the Hebrew soul; you would think that he had been building up his strength for years in order to resound to the Word of his people and bring his contribution to the Book. Elsewhere he could only show facets of his spirit; here spirituality itself unfolds, the mighty breath of the poet-prophets. Fable takes on its real dimensions, in the origin and creation of the world; to speak is to create; the word is lightning; the poem is made of stars, nights, days, dawn, water, woman; the man-hyphen shepherd receives the divine Word, comes down from the mountain, and transmits it. The living God reveals himself, the dove is the winged symbol from whom salvation is looked for; the angels, stilling their white wings, grow visible to Abraham's eyes, and the earth is present all around them just as they themselves are truly present without old Melchisidek the priest showing any sign of surprise; yes, they have taken on the reality which is now there in the hand that Abraham raises in front of his face, in "Abraham mourning Sarah." Then there is Joseph, full of music and sun like the shepherd Apollo, in the middle of his flock, a premonitory figure of one who, like himself, is to be sold. The prophets are afraid of their vision, or afraid at the Word which they alone hear; God is the only witness of their solitude and suffering; the heavens open, Jerusalem perishes, and the living are clearly one with the dead, left standing upright only to weep. Chagall makes the great drama and the tribulation his own, and the tempest that shakes him is transmitted to the paper in its violence, its gravity, its amplitude: what is happening here and now, around this well, amid this flock, is at the epicenter of the great theater of the world." Most of the etchings for The Bible were executed by Chagall between 1931 and 1939; the last pieces were completed between 1952 and 1956. The Bible was issued in an edition of 275 signed and numbered portfolios and 20 portfolios hors commerce. There are also 100 sets of the etchings with hand-coloring on paper with large margins, each of which is numbered lower left and initialed in pencil by Chagall lower right. References: Marc Chagall: Druckgraphische Folgen 1922-1966. 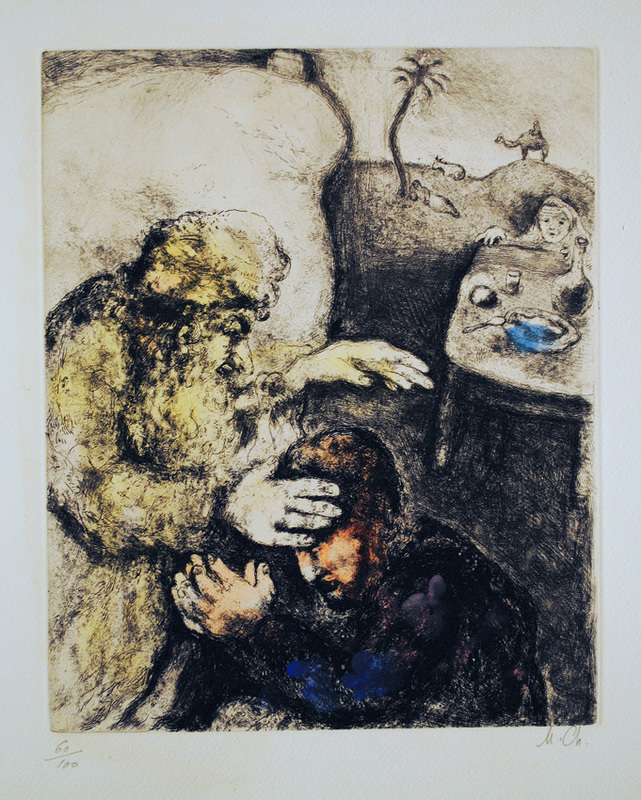 Verzeichnis der Bestände (Hannover: Kunstmuseum Hannover mit Sammling Sprengel, 1981); Charles Sorlier, Marc Chagall et Ambroise Vollard; Catalogue Complet des Gravures Exécutées par Marc Chagall à la demande de Ambroise Vollard (Paris: Editions Galerie Matignon, 1981). Important collections of Chagall's Biblical prints include Franz Meyer, Marc Chagall: His Graphic Work (NY: Abrams, 1957), Jean Adhemar, Chagall L'oeuvre grave (Paris: Biubliotheque Nationale, 1970), Jean Leymarie, Marc Chagall Musee National Message Biblique Marc Chagall (Nice: Musee National Message Biblique Marc Chagall, 1976), Charles Sorlier et al, Marc Chagall L'oeuvre grave (Nice: Musee National Message Biblique Marc Chagall, 1987), Ernst-Gerhard Guse, Marc Chagall Druckgraphik (Stuttgart: Westfalisches Landesmuseum fur Kunst und Kultgeschichte Munster, 1985). The paper size is 440x330mm (17-1/4x12-1/8 inches) for all works. The paper is white, but in some cases it reproduced darker than it should have in our photographs on our three web pages devoted to the etchings for the Bible. The Creation of Man (Hannover 276, Sorlier 199) Original etching, 1931-39; printed 1939. 100 signed and numbered hand-colored proofs plus 295 black and white impressions, of which this is one. Illustrated in Nice 1976 and 1987, Stuttgart 1985, and BN 1970). 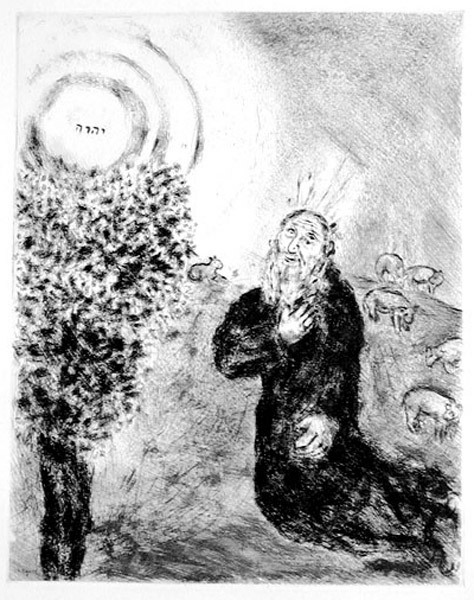 One of the most powerful of Chagall's Bible etchings here in a brilliant impression. 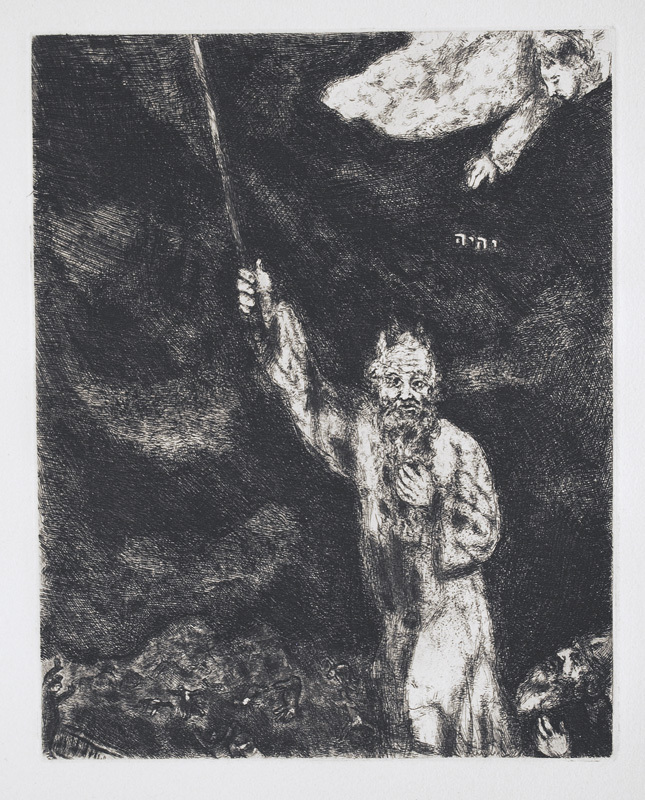 Plate 1 of his etchings for the Bible (published 1956). Image size: 306x228mm. Price: SOLD. 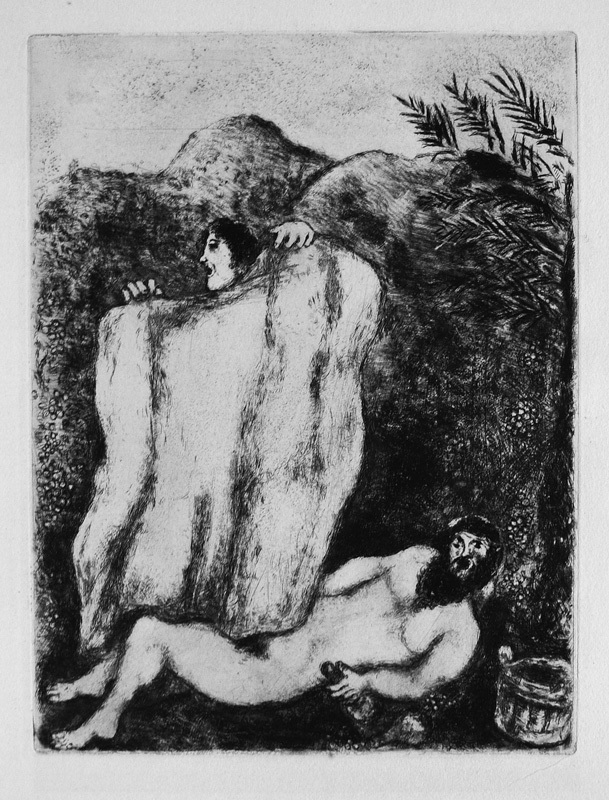 Le manteau de Noé / Noah Drunk (H. 280, S. 203) Original etching, 1931-39; printed 1939. 100 signed and numbered hand-colored impressions plus 295 black and white impressions, of which this is one. The story of Noah's drunkeness, which elicits the laughter of one of his sons and the care of two others, is also illustrated in Michelangelo's Sistine Chapel Ceiling immediately over the entrance for the laiety. The story is a reminder of human imperfection. Image size: 304x231mm. Price: $5000. Abraham mourning for the death of Sarah (Hannover 286, Sorlier 210). Original etching, 1931-39. 100 signed and numbered hand-colored proofs plus 295 black and white impressions signed in the plate lower right, of which this is one. A brilliant impression in excellent condition of one of Chagall's most acclaimed etchings. Illustrated in Passeron, Chagall: Maitres de la gravure, Meyer, Chagall's Graphic Works, and Nice 1987. Image size: 293x240mm. Price: $5000. Abraham mourning for the death of Sarah (Hannover 286, Sorlier 210). Original etching, 1931-39. 100 signed and numbered hand-colored proofs plus 295 black and white impressions signed in the plate lower right, of which this is one. 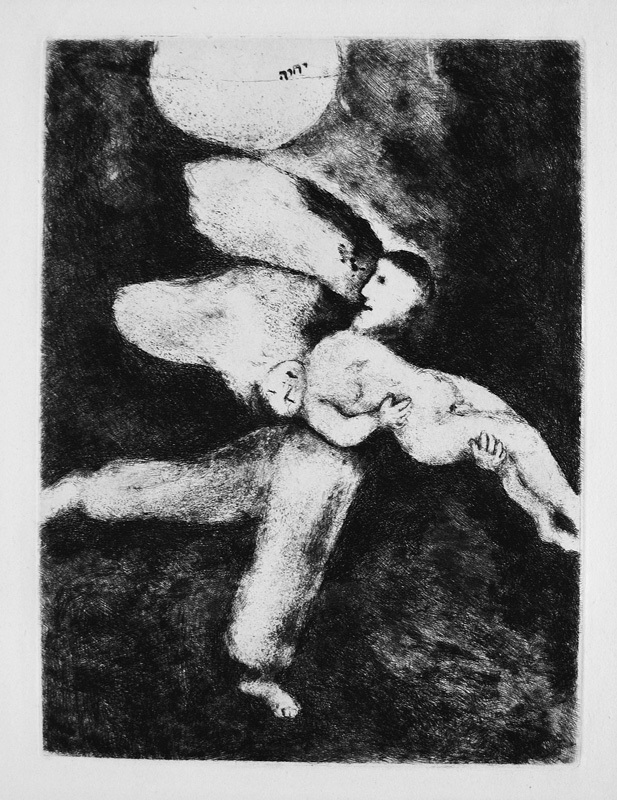 One of Chagall's most acclaimed etchings. Illustrated in Passeron, Chagall: Maitres de la gravure, Meyer, Chagall's Graphic Works, and Nice 1987. Faint mat stain 1/2" from platemark not affecting image (treated at the Wisconsin State Historical Society Conservation Lab). Image size: 293x240mm. Price: $5000. Isaac Blessing Jacob (Hannover 288, Sorlier 211). Original etching, 1931-39. 100 signed and numbered hand-colored proofs (of which ours is n. 60/100) plus 295 black and white impressions signed in the plate. One of Chagall's most acclaimed etchings with very vibrant and extensive hand-coloring by Chagall. 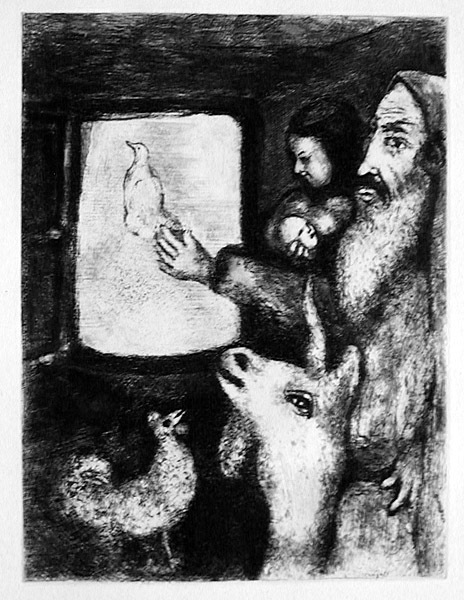 Illustrated in black and white in Güse, Marc Chagall Druckgraphik (Westfälisches Landmuseum für Kunst und Kulturgeschicte Münster, 1985). Image size: 295x236mm. Price: SOLD. 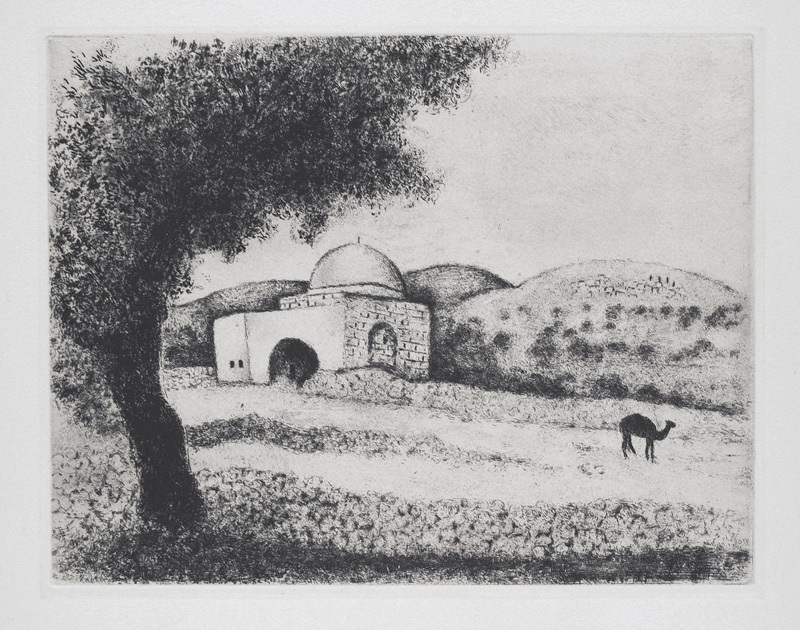 The tomb of Rachel (H. 292, S. 216) Original etching, 1931-39; printed 1939. 100 signed and numbered hand-colored proofs plus 295 black and white impressions signed in the plate lower right, of which this is one. 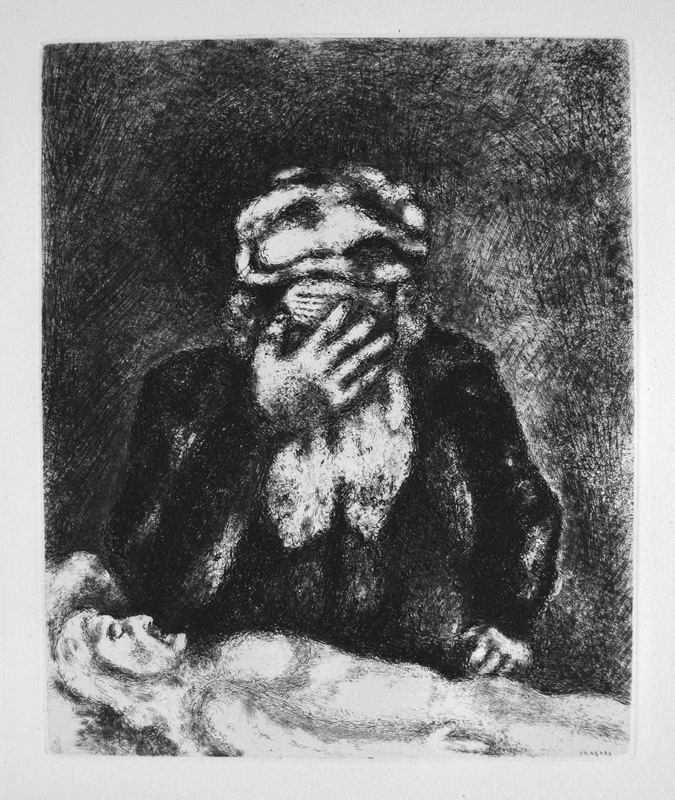 Included in the 1970 retrospective of Chagall's prints at the Bibliotheque National (one of 25 etchings from the Bible out of the 100 Chagall executed. Image size: 237x305mm. Price: $4750. 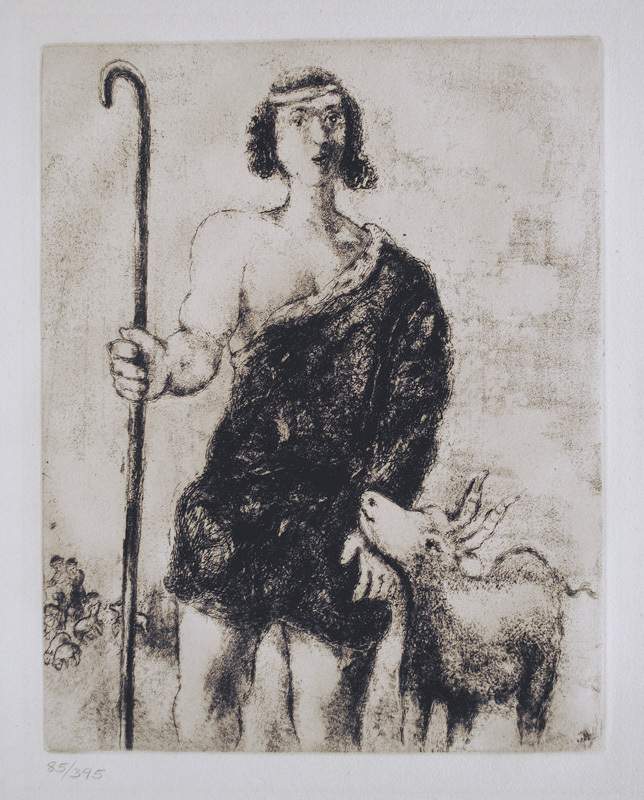 Joseph Berger / Joseph as a shepherd (Hannover 293, Sorlier 215). Original etching, 1931-39, printed 1939. 100 signed and numbered hand-colored impressions plus 295 black and white impressions signed in the plate lower right. 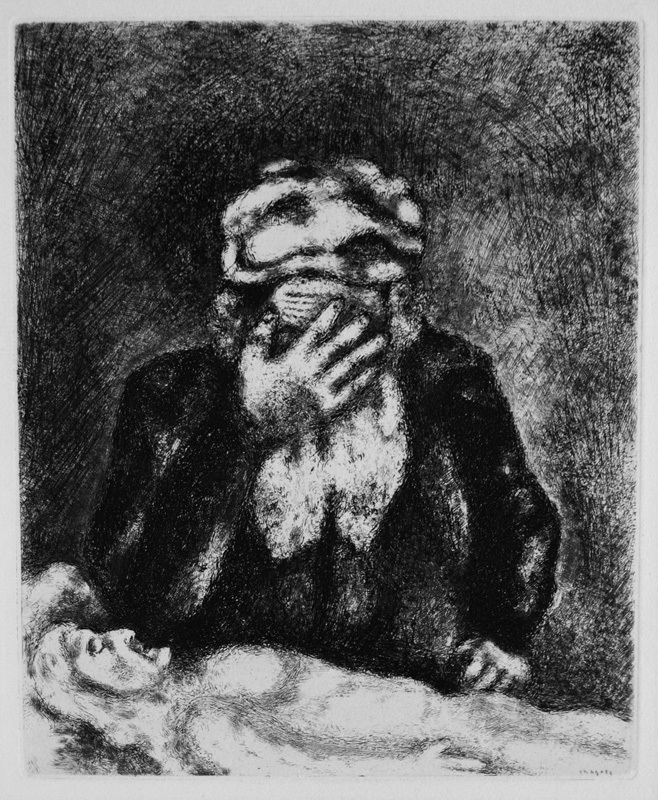 One of Chagall's most acclaimed etchings. Illustrated in Meyer, Chagall's Graphic Works, Bib. Nartional 1970, Nice 1976 and 1987, and Ernst-Gerhard Guse, Marc Chagall Druckgraphik (Stuttgart: Westfalisches Landesmuseum fur Kunst und Kultgeschichte Munster, 1985). Image size: 300x235mm. Price: $5500. The numbering lower left (85/395) was added by a dealer to suggest that this impression came from copy n. 85/100 of part of the total edition of 395 portfolios. Moses and the Burning Bush (H. 302, S. 225). Original etching, 1931-39. 100 signed and numbered hand-colored proofs plus 295 black and white impressions signed in the plate, of which this is one. Image size: 295x230mm. Price: SOLD. Moses and Aaron before Pharoah (H. 305, S. 228). Original monoprint with extensive hand coloring on top of an etching, 1931-39. Ours is a unique hand-painted trial proof before the edition of the hand-colored etching. In this proof, most of the colors that will be used in the final version are present, but they are not applied in the same places. For the finished print, there were 100 signed and numbered hand-colored proofs plus 295 black and white impressions signed in the plate. Image size: 288x225mm. Price: SOLD. Darkness over Egypt (H. 306, S. 229). Original etching, 1931-39. 100 signed and numbered hand-colored proofs plus 295 black and white impressions signed in the plate lower right on Moses' cloak at the platemark, of which this is one. Illustrated in Meyer, Chagall's Graphic Works and included in BN 1970. Moses is here shown invoking the plaguje of darkness uon the terrified Egyptians to convince them to obery the Lord and to let His people go.Image size: 291x228mm. Price: $6000. Moses breaking the tablets of the Law. (H. 314, S. 237) Original etching, 1931-39. 100 signed and numbered hand-colored proofs plus 295 black and white impressions signed in the plate, of which this is one. Image size: 294x231mm. Price: SOLD. Rudolf Schlichter, Karl Schmidt-Rottluff, Siegfried Schott, Georg Tappert, Wilhelm Wagner, and others. To purchase, call us at 1-800-809-3343 (1-508-529-2511 in Upton MA & vicinity) or send an email to spaghtwood@gmail.com.